It was the team’s worst throttling since the April 25, 1974 Kansas City massacre in which the Royals pummeled the Twins to the tune of 23-to-6. The only other time the team would allow 20 runs would be in their inaugural season in which they lost – once again in Kansas City but to the Athletics - 20-to-2. Don't be fooled: neither Kansas City team had the offensive firepower nor hitter-friendly ballpark and atmosphere found at the Ballpark in Arlington. The Rangers ripped through Nick Blackburn and then the Twins bullpen. Ron Gardenhire continued to pull another arm out each inning like his relievers were Kleenex. After burning through four arms, he called upon the player whose has played just about everywhere else: Michael Cuddyer. To me, it seemed that MLB.com’s pitch f/x system had difficulties classifying the 16 pitches Cuddyer threw towards the plate, considering some four-seamers, others changeups, a few cutters and a pair of sliders. This isn’t unusual for the pitch f/x system to have difficulties labeling a pitch – especially one with the erratic tendencies of a super utility player. However, when asked about his repertoire after the game, Cuddyer told MLB.com’s Rhett Bollinger that he did indeed through an assortment of pitches (or at least attempted to throw them). You would figure that a player such as Cuddyer would get in there and grip and rip. Maybe try to throw that snap-dragon bender he had been working on while warming up with the fellow outfielders. Judging from his short-arm, three-quarter inconsistent slot it’s easy to see why the fielder had difficulties putting the finishing touches on a sinker or pinpoint command of his fastball. Still, blessed with a good arm in the outfield, the radar gun, as well as the pitch f/x cameras, caught Cuddyer’s fastball traveling 88 miles per hour (a Delorean fastball). While we don’t have data to see how this compared to the franchises more recent position-player-turned-pitchers in John Moses and Dan Gladden, I would wager that he was throwing harder than they ever did. Mercifully, the Rangers somehow didn’t score a run off of him in spite of the defense’s best efforts. Pending any more opponent outbursts, Cuddyer is likely safe to retire his pitcher’s glove and go down in Minnesota history with Cesar Tovar as the only position players with 0.00 ERAs. 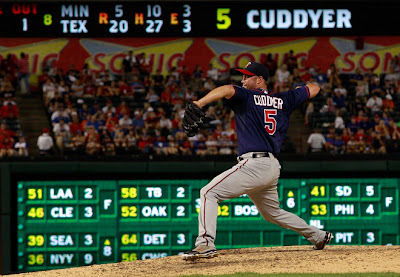 Given the state of this team right now, I'm not so sure that it's safe to assume this will have been Cuddyer's only career appearance on the mound for long. I wonder which of his gloves he used? Had to be a tough decision! At least that inning was fun for him. He's having a great year for his personal memories -- even if the team's performance would best be forgotten.